Featuring a sleek, stylish, aerodynamic design unlike anything else in its segment, the 2016 Kia Optima Hybrid delivers up to 40 mpg of fuel efficiency with its innovative hybrid system and intelligent engineering. You won’t have to compromise on comfort, either – the Kia Optima Hybrid features a spacious interior crafted from premium materials. Driving a hybrid has never been this fun. The 2016 Kia Optima Hybrid is a full size family sedan with unbelievable fuel efficiency! The 2016 Kia Optima Hybrid comes with a standard 2.4 Liter Inline 4 Full Parallel Hybrid System with a Interior-Permanent Magnet Synchronous Motor. This hybrid operates on a Electronically Controlled 6-Speed Automatic transmission with H-matic and can generate 159 horsepower and 154 lb-ft of torque through the engine while the motor generates 47 horsepower and 151 lb-ft of torque. Achieve 36/40/38MPG City/Highway/Combined** in a new 2016 Kia Optima Hybrid! The 2016 Optima Hybrid has amazing standard exterior features including: Front & rear bumper valence, Spare tire, side sills; Chrome finish exterior door handles; Dual body-color heated power mirrors; Mirror-mounted led turn-signal indicators, 16-inch alloy wheels, Unique front grille, Variable intermittent windshield wipers, Projector beam headlights, Heated rear glass with timer, LED rear combination lamps, Locking fuel-filler door, and Auto light control. If you want more stylish exterior features, take a look at the 2016 Kia Optima Hybrid EX where you can find more exterior features including: High-Intensity Discharge (HID) projector beam headlights with auto-leveling, Solar control glass, LED positioning lights, Power-folding outside mirrors, Front fog lights, Front door and lower center fascia mood lamp, Sound absorbing front windshield and front door windows, and 17-inch alloy wheels. The 2016 Kia Optima Hybrid has a premium interior, complete with everything that you could want in your next car! The 2016 Kia Optima Hybrid comes standard with plenty of convenient interior features including: Illuminated ignition key lock cylinder, Front seat back pockets, Day/Night interior rearview mirror, Dual illuminated visor vanity mirrors, Cooling glove boz, Front center console with armrest and storage, Virtual engine sound system, Dual map lights, Six-way adjustable driver’s seat with power lumbar support, Satin chrome inside door handles, Power door locks, Dual-zone automatic temperature control w/ center console rear vents, Leather-wrapped steering wheel and gear shift knob, Rear reading lights, Interior lighting with delay, Dual front cupholders, Cloth seat trim with anti-stain treatment, Glove box illumination, Push button start with Smart Key and Immobilizer, Power windows, Height adjustable front seat belt anchors, Carpeted floor mats, Overhead sunglasses holder, Fixed rear seatback with ski pass through, and a Tilt and telescoping steering column. Find standard available features on the Hybrid EX trim including: Electronic Parking Brake (EPB) with Auto Hold, Heated rear seats, Heated front seats, Driver’s Seat Memory, Folding rear center armrest with cup holders, Ventilated front seats, 10-way power-adjustable driver’s seat, Dual front illuminated cup holders, Leatherette-wrapped center fascia, Heated steering wheel, Stainless-steel illuminated door scuff plate trim, Four-way power adjustable front passenger’s seat, Auto-dimming mirror, Leather seat trim, and a Stainless steel gear shift bezel. The standard 2016 Kia Optima Hybrid comes with plenty of radio and tech features to keep you entertained, including: Cruise control with steering wheel controls, AM/FM/CD/MP3/SiriusXM® 6-speaker Audio System, USB/Auxiliary input jack, Bluetooth® Wireless Technology hands-free connectivity, Active Eco System, Supervision Meter Cluster with Thin Film Transistor (TFT) LCD Trip Computer, and Steering wheel mounted audio and phone controls. The Hybrid EX comes with even more! Find upgraded features on the EX trim including: Rear camera display , Infinity® Premium Audio System with HD Radio™ Technology, Navigation System with SiriusXM® + Services, UVO eServices Infotainment System, 8 speakers, and an External amplifier & subwoofer. It’s easy to get everything you want in your new 2016 Kia Optima Hybrid! If you think the 2016 Kia Optima’s interior and exterior are stacked, you should check out its standard safety features! Some of the standard safety features on the 2016 Kia Optima Hybrid include: High Line Tire-Pressure Monitoring System (TPMS), Hill Start Assist Control (HAC), Brake Assist System (BAS), Electronic Brake-Force Distribution (EBD), Traction Control System (TCS), Electronic Stability Control (ESC), Dual Front Advanced Airbags, Dual Front Seat-Mounted Side Airbags, Full-Length Side Curtain Airbags, 3-Point Seat Belts For All Seating Positions, Internal Emergency Trunk Release, Rear Child-Safety Door Locks, Four-Wheel Disc Brakes w/ Antilock Braking System (ABS), Front Seat-Belt Pretensioners, Lower Anchors and Tethers for Children (LATCH), Front and Rear Crumple Zones, Side-Impact Door Beams, and Vehicle Stability Management (VSM). The 2016 Kia Optima Hybrid is jam-packed with innovative conveniences and amenities. The white interior package makes the cabin more luxurious than ever with white leather seats, while available ventilated or heated seats make the inside comfortable regardless of the temperature outside. Plus, the smart key lets you start your Kia Optima Hybrid with just the push of a button. 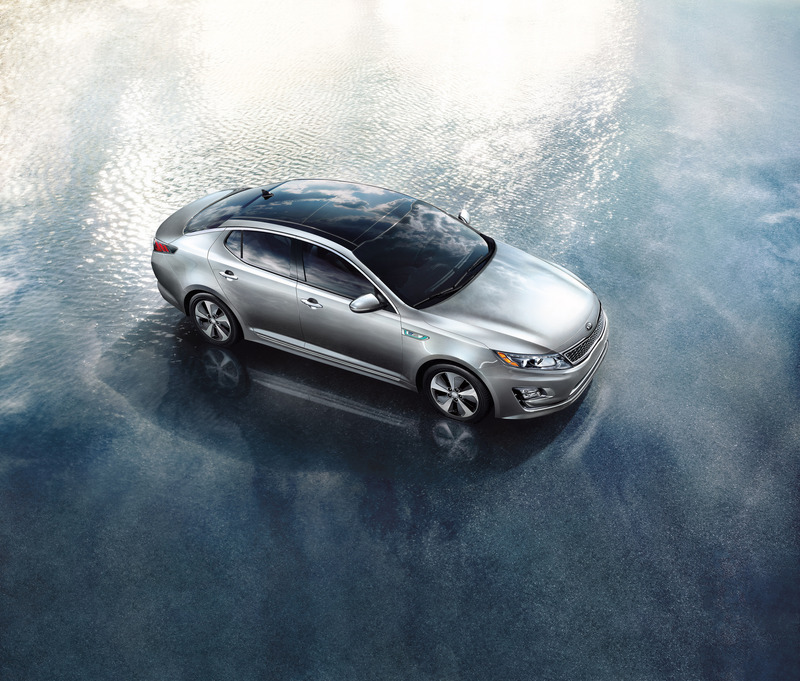 There’s nothing the Optima Hybrid’s cutting-edge tech can’t do.